I found my camera in Adria's room so theoretically, I should be back in action, right? Somehow…I didn't find any time to blog? The week has been a fairly good one in that I had Bust A Move class on Monday and Tuesday and then Bingo last night so I've been a creating cardstock cutting maniac. Bingo was a blast last night and the ladies went home with some really good prizes. Why did I forget to take a picture? Probably because we were having too much fun! Should probably share the Bingo cards this next week. Join Hostess Club and commit to 8 months in the Club and place a minimum of $20/month for the session. I send a PDF with the monthly card samples and video tape the card demonstrations so member can assemble cardstock packets in person. I will set up a Hostess Code for each club so you can choose to order online and have the items shipped directly to you, should you desire…. 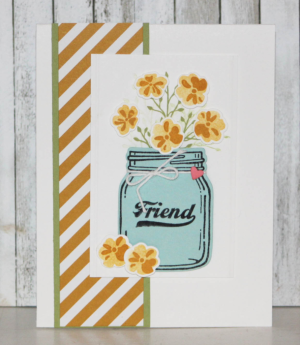 This was one of the cards that we stamped for Hostess Club in July. I've added the video should you wish to see how it's completed. Please contact me to join the fun and receive all the goodies of Hostess Club. We do make Stinkin' Cute cards! That's all for today. I should whip up a newsletter. Are you on my mailing list? and then need to head out to the garden to plant some things, weed some more things, and hopefully harvest a few things. :) Happy Stamping!